Home > Hookin on Hump Day > Hookin On Hump Day #88: Link Party for the Fiber Arts! 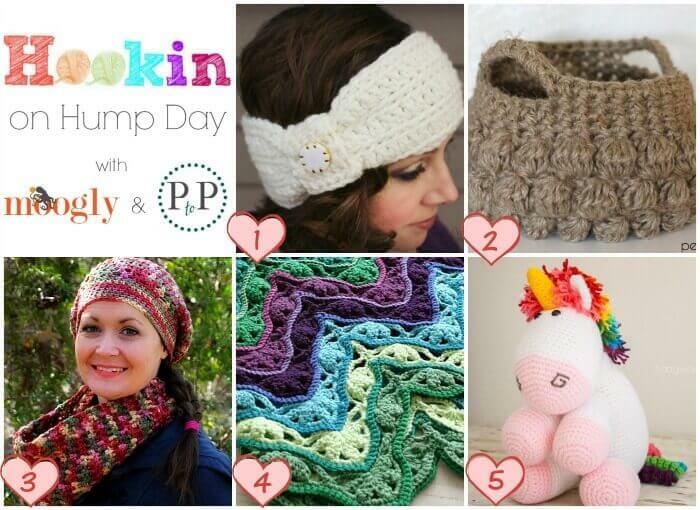 Hookin On Hump Day #88: Link Party for the Fiber Arts! 1. MOST CLICKED LINK: Wintertide Headband by Beatrice Ryan Designs: A feminine and classy accessory for those chilly days … and it’s a FREE pattern too! 2. Jute Bobble Basket by Persia Lou– This jute basket is such a pretty way to keep organized … make your own with the FREE pattern! 3. Crocheted Raspberry Cowl Pattern by Seven Alive – A beautiful FREE cowl pattern … makes a great gift too! 4. Brighton Blanket Free Crochet Pattern by Felted Button – This gorgeous afghan is full of beautiful colors and textures … perfect for snuggling up with! And it’s a FREE pattern too! 5. Rainbow Cuddles Crochet Unicorn Pattern by One Dog Woof – How adorable! This rainbow unicorn is sure to delight … FREE pattern too! Previous Post: « Crochet Heart Applique Pattern … Perfect for Valentine’s Day! I would love to have the beautiful afghan pattern #4. I tried to download, but there was not a “run” for me to click on. So glad you joined us, Jessica!